A mist-shrouded forest connecting the village of Majula to several other important locations including the Shrine of Winter and Aldia's Keep. The Woods occupy an ancient territory where great misdeeds were once committed; the remnants of this dark history can be seen among the crumbling ruins and unnaturally thick fog. The Shaded Woods appear to have once been the remnants of Aldia (presumably a town named after Lord Aldia) if the references are to that, and also the location of a great battle. This battle was likely against the Giants who had set siege to the King's castle. The (pre-SotFS) Giant Lord soul description reads, "The Giants landed on the northern shores, and set siege to King Vendrick's castle to claim an invaluable prize." Vengarl tells us that he was hired by the King as a mercenary, and that he was killed in battle. 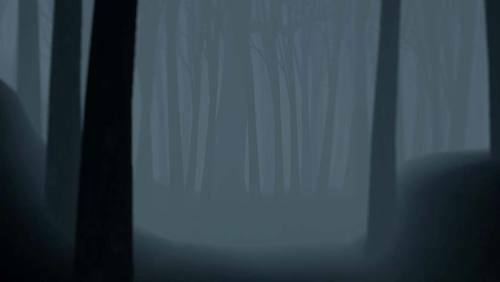 We find his head within the Shaded Woods area that is thick with fog, ghostly mercenaries and trees that groan when struck. From what we know of the Giants and their death cycle, it may be that these trees are the remains of Giants who fell in that battle, and the ghosts are the mercenaries who fought on Vendrick's side. It also explains why the structures in the Shaded Woods have fallen to ruin. It is interesting to note the proximity between where Vengarl fell and Lord Aldia's manor, especially when Aldia himself makes a strong reference to Vengarl in his dialogue. This strongly implicates Aldia as the reason for Vengarl's condition. Goblin: Goblins are humanoid creatures that lurk in the Shaded Woods. These deformed monstrosities give a grotesque impression and do not appear to be products of a natural evolution; rather they seem to have once been human. What twisted force could have rent their humanity and left them in this sad state…? Basilisk: A peculiar species of reptile which has developed a number of ingenious adaptations for self-defense. The large bulbous eyes on their heads are in fact fake and act as deterrents to would-be predators; Basilisks are also capable of spraying a petrifying mist which has earned them their well-deserved name. Giant Basilisk: An impressive Basilisk specimen of enormous size with mottled green skin like that of a chameleon. Whether these creatures are the result of a divergence in the species' evolutionary line or the product of an Aldian experiment is unclear. They are not actively predatory and will make no attempt to attack unless cornered, so observers not looking for a fight would be wise to give them a wide breadth. Lion Clan Warrior: A species of anthropomorphic lions whose sudden appearance on the stage of history suggests that they are not of natural origin. They despise other races and will arbitrarily slaughter those not of their clan. Forest Guardian: Guardian spirits lurking in the thick fog of the central Shaded Woods. Their identities are completely unknown as they barely maintain corporeal forms and are almost invisible against the mist. Are they fallen soldiers of a war long past, or the remnants of a clan that once dwelled in this ancient land? Scorpioness Najka: The wife of Manscopion Tark, a fragile soul created long ago by an ancient being in the throes of madness. Najka herself has succumbed to the very affliction which felled her master and has devolved into a ferocious beast, a threat to all living things. "I wish to ask a favor of you. I want you to kill my betrothed. Once, I always found her at my side. But as time went on, things went awry. She became violent, raging uncontrollably. Eventually she came after me. And we've been locked in combat ever since." "We seem to be at a standstill. The wounds we exchange are never lethal. I was born of my master's madness. Perhaps this is some curse. I will be sure to assist you in return." After defeating Najka - "You've defeated my better half. This is my thanks. Take it." Najka was born of the misdeeds of an ancient being, frail soul from the beginning, that soon succumbed to madness. Use the special soul of Scorpioness Najka to acquire numerous souls, or to create something of great worth. Guardian spirits lurking in the thick fog of the central Shaded Woods. Their identities are completely unknown as they barely maintain corporeal forms and are almost invisible against the mist. Are they fallen soldiers of a war long past, or the remnants of a clan that once dwelled in this ancient land? A species of anthropomorphic lions whose sudden appearance on the stage of history suggests that they are not of natural origin. They despise other races and will arbitrarily slaughter those not of their clan. Shield used by the Lion Clan warriors. Made of wood, but reinforced with metal. Light yet sturdy. The design on the shield appears to have some religious significance, but we will never know what sort of gods these warriors answer to. Greataxe wielded by Lion Clan warriors. The finely-crafted blade cuts smoothly, evidence that the lion clansmen are much more than vulgar beasts. Cape worn by Lion Clan warriors. The Lion Clan are an offshoot race that have no ties to humans, and would murder anyone with the curious notion of approaching them. The lion clansmen seem to despise their own looks, as they hate being seen. Effect: Reduces falling damage. Robe worn by Lion Clan mages. The Lion Clan are an offshoot race that appear in historical records quite abruptly, as if one day they climbed up out of the depths of the very earth itself. Effect: Improves casting speed.